On October 6, 2015, fans will finally be able to complete their collection of Peanuts theatrical movies on DVD, when Paramount Home Video will release the fourth and final classic Peanuts animated movie, Bon Voyage, Charlie Brown. In this 1980 film, Charlie Brown, Linus, Peppermint Patty, Marcie, and Snoopy travel to France as exchange students, and encounter mystery, history, and humor (of course). The film's main setting is based on the chateau that Charles Schulz was billeted at for six weeks in World War II. This release was promised last year when Paramount announced the Race for Your Life, Charlie Brown DVD, but it didn't have a firm release date or details until now. 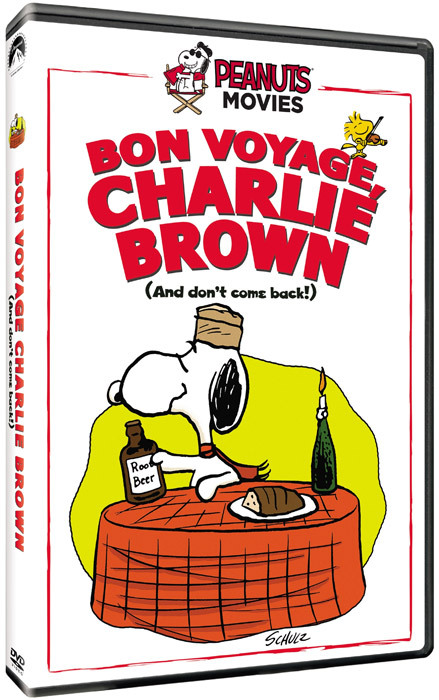 Bon Voyage, Charlie Brown will be presented in 16:9 widescreen on the DVD, which will also include the movie's theatrical trailer and a new making-of featurette with new interviews with Jean Schulz, Lee Mendelson, and Steve Melendez (son of animator Bill Melendez). It's nice to see Paramount actually including a bonus feature! The Bon Voyage, Charlie Brown DVD has a suggested retail price of $14.99, and can be pre-ordered now from Amazon and other retailers. Warner Home Video has also announced a "new" Peanuts DVD for October, although it's less exciting, since all the shows have been released previously (see below for details). 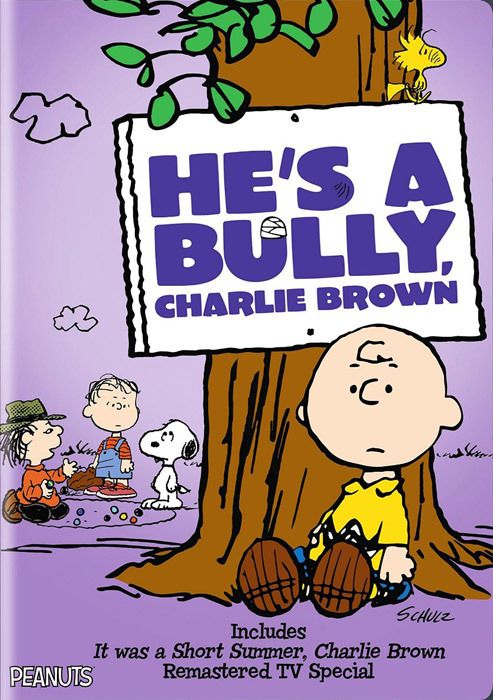 The DVD is titled He's a Bully, Charlie Brown, and features that 2006 television special as its main feature, together with It Was a Short Summer, Charlie Brown and The Charlie Brown and Snoopy Show Episode 2: Snoopy - Team Manager as "bonus" episodes. There are no bonus features. The DVD is due out October 6, 2015, has a suggested retail price of $19.97 and is available for pre-order now. Be warned that the copy of It Was a Short Summer, Charlie Brown on this DVD is edited and missing three minutes of the show, for reasons unknown. If you want to own that show on DVD, you should get the Peanuts 1960's Collection box set instead, where the show is presented in its full length. He's a Bully, Charlie Brown is also available on the You're Not Elected, Charlie Brown Deluxe Edition DVD; It's a Short Summer, Charlie Brown is available on the Peanuts 1960's Collection box set; and the Charlie Brown and Snoopy Show episode is available on the complete Charlie Brown and Snoopy Show DVD set. So if you have all those, you don't need this repackaging; and if you don't have them, they're better choices than this DVD - especially given that It Was a Short Summer is unnecessarily edited. Glad to see the last movie is finally arriving! Hope they'll release it as a 2-fer with Race For Your Life just like they did with A Boy Named CB and Snoopy Come Home, so I can buy all four in two shots.